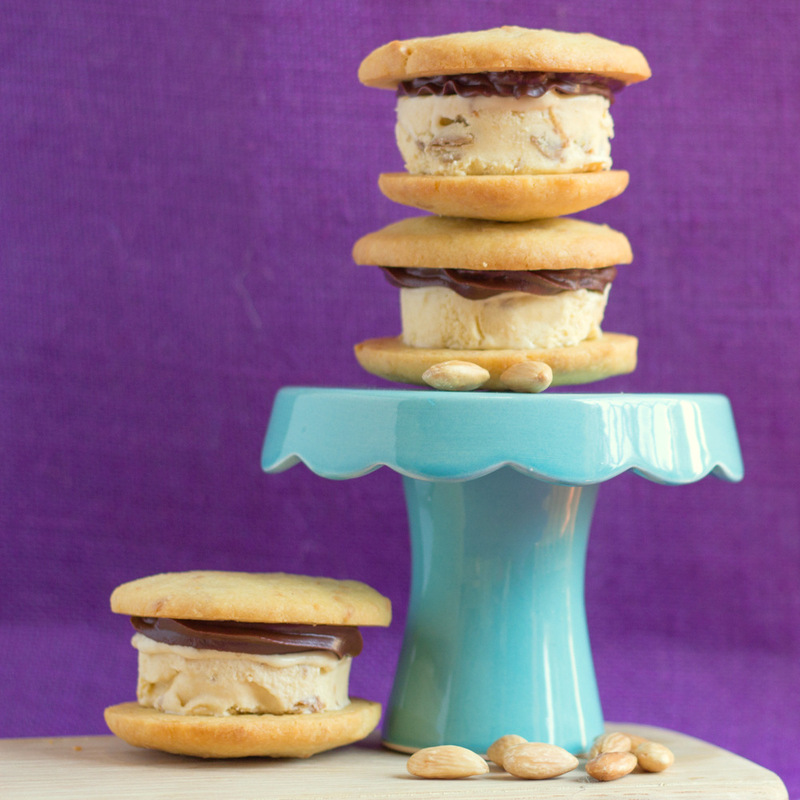 These grown up ice-cream sandwiches are AMAZING. Made with Amarula liqueur, caramelised roasted pears, almond studded “cheat’s shortbread” biscuits and a swirl of dark chocolate ganache. If that combination doesn’t tantalise your taste buds, then I don’t know what is wrong with you. This was the first time I made ice cream by making a cooked custard, as I usually make it with condensed milk and cream, and it was completely worth the effort. The Amarula and Pear have such complementary flavours, and the sweetness of the ice cream is offset by the buttery shortbread. Spray a roasting tray with non-stick spray. Add the quartered pears to the tray. Sprinkle the brown sugar and butter cubes over the pears. Roast in the oven for 30 to 40 minutes, turning halfway through cooking time. Pears are done when a butter knife easily goes through them. Remove the pears from the oven, and allow to cool before adding to a food processor and blending into a puree. Fill a big bowl with water and ice, and place a smaller bowl inside it. This will be used to cool the ice cream custard after it has cooked. In the bowl of an electric mixer, add the egg yolks and sugar. Mix together until they have a ribbon consistency. In a pot on a medium heat, add the cream, milk and amarula and heat to just before boiling point. Remove from the heat, and set aside for 5 minutes. Turn the electric mixer on, slowly add a bit of the cream mixture to the egg yolks. Continue to add the cream slowly, and then return the mixture to the pot. On a medium heat, cook the custard mixture, whilst constantly stirring. The custard is ready when it thickly coats the back of a spoon. Remove the custard from the heat, and pour through a sieve into the small bowl sitting in the ice water. Add the pear puree, and whisk until the mixture has cooled. Add the mixture to an ice cream maker and churn for 40 minutes. Place in a container, and into the freezer to harden up further. In a microwave proof bowl, heat the cream in the microwave on full power for 60 seconds. Add the chocolate to the cream and stir until it has all melted. Place the almonds on an oven tray, and roast for 10 minutes. Leave to cool slightly before adding to a food processor. Process the almonds into small pieces. In the bowl of an electric mixer with a paddle attachment, cream together the butter and sugar. Add the flour, toasted almond pieces and amarula, and mix until a dough is formed. Roll the dough into ping pong ball sized pieces, flatten, and place on a lined baking tray. Cook the biscuits for 12 to 15 minutes until the bottoms are starting to brown. Allow to cool fully before using. Spoon some chocolate ganache onto a biscuit. Top with a scoop of ice cream and another biscuit. Serve immediately before the ice cream melts.